Will Barra Keep Killing Mexicans with Chariots of Death? Will Trump Stop the Carnage? Almost two years ago, Mary Barra vowed to make safety a top priority. It was a lie. The arrogant comment that “sometimes accidents just happen” is indicative of a hypocritical corporate culture that speaks out of both sides of their mouth: making safety a priority in one breathe, denial of unsafe practices in the other. Mary Barra appears to have deceived us all. Her reluctance to address or change the unsafe practices in Mexico promptly or swiftly demonstrate that she herself will not speak up for safety. Instead of grabbing the bull by the horns when Latin NCAP approached her in November, Barra’s spokespeople have provided canned answers of little substance. In January, she defended GM’s unsafe practices and showed her true colors. The International Business Times headline says it all. We all know that GM is a global company that should be incorporating the highest U.S. safety standards domestically and abroad, and acknowledging that Hispanic lives matter. Read our full investigative report here. We want GM to sell all their vehicles with life-saving airbags as a standard feature in Mexico and around the world. 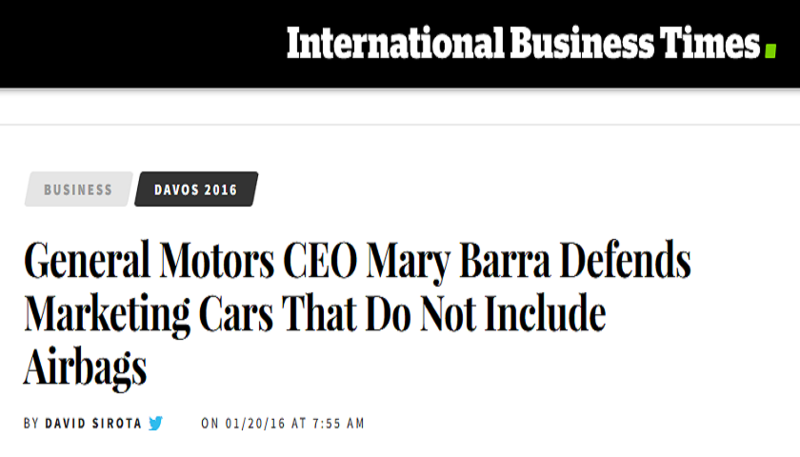 We want Mary Barra, the CEO of GM, to apologize to the public for lying about acting quickly on safety. She decieved us. The Consejo de Latinos Unidos (CDLU) is a national nonprofit organization and consumer advocacy group which educates and assists Latinos and others. Founded in 2001, the CDLU’s has been a leader in defending and assisting the public from abuses by irresponsible businesses and inept government agencies. The investigative reports and efforts of the CDLU have provoked several U.S. congressional probes including hearings by the U.S. House Energy and Commerce Committee and the U.S. Senate Finance Committee. Staff of the CDLU have been interviewed by numerous leading media outlets and testified or provided documentation to several governmental bodies and agencies including the California Legislature, the Pennsylvania Civil Rights Enforcement Division, the Colorado Civil Rights Commission, the Chicago City Council, and the Florida Legislature. The Wall Street Journal declared CDLU's successful efforts against overcharging hospitals "a big win." The Washington Post called the CDLU "the lead agitator" against aggressive collectors. El Nuevo Dia praised the CDLU as "Heroes of Our Time" for CDLU's Medical Aid Program. People Magazine highlighted how the CDLU "deployed all the hardball tactics" to help the poor. Email us directly or call +1-323-264-5889. Copyright 2016 © All rights reserved Consejo de Latinos Unidos, Inc.